Are you ready for some March Madness? The NCAA Tournament officially kicks off on Tuesday with two First Four games, as Prairie View A&M and Fairleigh Dickson battle for the first win of the tournament and the right to get blasted by Gonzaga on Thursday. Then Belmont and Temple take the stage in Dayton, Ohio, with the 11-seeded winner moving on to an entirely winnable battle against Maryland. Of the two, there's one ATS pick I love and one total play I'm making in the First Four on Tuesday. You can find that along with an NIT pick I believe is a strong play. All you have to do is keep reading. It's the perfect combination of up-tempo team with Prairie View A&M and sub-250 defense in Fairleigh Dickinson. Fairleigh Dickinson does not move as fast but does shoot the three at a ridiculous clip -- 40.5 percent, good for fifth in the country -- though that's not its primary use of getting points. While the 11-seed game later will feel like its carrying a bit more pressure since it sets up a meeting with Maryland rather than Gonzaga, those stakes set up well for both teams of play loose. Lets jump in and root for points! Not only is SportsLine's Kenny White the Wizard of Odds, but he's been red-hot with his college basketball ATS picks, going on a 16-7 run entering Tuesday. Now he's locked in a strong pick in Tuesday's First Four matchup between Fairleigh Dickinson and Prairie View A&M. Check out his pick over at SportsLine. I really believe that both of these teams are capable of moving on from Dayton and defeating Maryland in the first round, and that's because I respect both of these basketball teams. On CBS Sports HQ I've been a strong proponent of Belmont as a sleeper pick for the Sweet 16, but here the pick is Temple to cover the number because these are both not only good teams but comparable teams. With all the tension of the single-elimination tournament status setting in for the night cap here on Tuesday, I could just see both teams playing this tight down the stretch and a one-possession winner on either side. Over in Tuesday's other First Four matchup, Belmont and Temple square off for the right to advance to the next round and a matchup with Maryland. 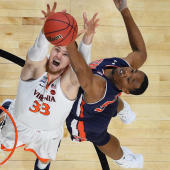 SportsLine expert Josh Nagel is a remarkable 50-33 in his last 83 college basketball picks, and while we can tell you he's leaning Under, you'll have to head over to SportsLine to check out his strong ATS play. The main play here is motivation, noting that Lipscomb was much closer to the NCAA Tournament bubble than the Wildcats. Maybe the NIT, especially starting play on the road at Davidson, doesn't hold the attention of the Lipscomb team to the point of really motivating them to extend the season. Davidson, also, covered the spread 64.3 percent of the time at home, and should be charged up to finish the season on a better note after losing by a whopping 23 points to Saint Louis in the Atlantic 10 conference tournament. Tuesday's NBA slate brings six games, and DFS pro Mike McClure has shared his optimal lineup for the six-pack for FanDuel, DraftKings and Yahoo daily contests. You can see his lineups only at SportsLine.